Thanks everyone for your expressions of love and support these last few weeks! We hope you all know how much we love you. Here we go!! A few years ago I took a course at my church on Spiritual Disciplines. Each week we would explore one of the disciplines (a life pattern that listens to God) and would have an assignment for exploring that discipline in the coming week. One week the discipline was "spiritual friendship", which was a new one to me. It basically comes down to be willing to be close enough to someone to let them speak into your life from a different vantage point. Our assignment for the week was to spend some time with a close friend and to ask them to tell you what they particularly appreciated about you and (if you were daring enough!) what weakness they saw where you could seek to improve. Well, as things would happen, my friend Bill and I were on a long drive together that week, so I decided to ask the first question and see how it went before trying the weaknesses part. Bill was very encouraging, so I paused, swallowed, and asked him where he thought I could improve. It sure seemed like he had more to say this time (surely just my pride being beat-up a little), but one thing that particularly stuck with me was his observation that I seemed to be good at avoiding things that I didn't accel at, that I only let people see me succeeding. I must admit that this is totally true, and you would only have to find me hiding away in a back room dabbling with watercolors to prove that it's still true (and no you can't see them :-). 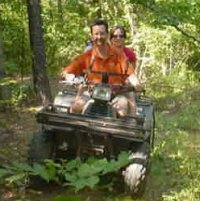 So this past weekend we were enjoying the country life at Crystal's brother Lonny's ranch in Arkansas and Bill's spiritual friendship came into play yet again when Crystal excitedly asked, "When are we going to go four-wheeling?" Personally, I thought hanging out by the pool was adventure enough, but before I knew it engines were roaring and I was having to ask for a little lesson on how to work these fearful machines. Lonny quickly threw switches, started it up, worked the gearshift up and down a couple of times (noting that it generally skipped neutral and shifted straight between first gear and reverse), and declared me educated. Time to start looking stupid: "Woh...slow down...does down on the gear shift change to a higher or lower gear?" After a few minutes on the paved farm drive with Crystal hanging on for dear life and reassuring me I was doing fine, I had decided that that might be enough adventure for the day, but Crystal's enthusiasm and Bill's silent encouragement got me to follow everyone across the road and to the terrorizing hills that had been the fodder of four-wheeling stories the previous day. ("Which control is for the front brake and which is for the rear??") Across pastures, dodging cattle, running over small trees, brushing away thistles, down into the stream bed...across the little trickle....up the opposite bank ("Don't gun it or you'll flip over!"). Wow, I can do this.... "Are you ready to go down the big hill?" Lonny asked. Fortunately, Tom volunteered to drive me down it on his 'Cadillac' automatic-transmission four-wheeler so down we went. We crossed back over the road and Crystal got her chance to show off by tearing across the pasture with death-defying speed. She had said earlier that she had been more adventurous when she was younger, but education had put some sense into her head. Lonny's comment was that somewhere zooming down that grassy hill her education must have fallen out! Anyway, it was a blast, and I survived, and nobody seemed half as concerned about me being the raw beginner than I did. As we sat in the driveway and traded stories together, Loni & Chris rode up on their horses. Someone asked, "Hey Rob! Have you ever ridden a horse?" "Um, no...tell you what, I'll try that out next time!" Thanks Lonny. Thanks Crystal. And thanks Bill. When we ask for "express shipping" or promise "I'll ship it to you" somehow the little word ship seems like a remnant of a by-gone age. But no, when one is trying to shift to life on another continent (or at least an island off of another continent), "shipping" becomes a bit more concrete. To be more specific, it is upon this ship that our belongings will soon fight through wind, wave and storm, to hopefully rendezvous with us in the Old Country. Probably the most confounding part was when we found out that we had to file an SED (Shipper's Export Declaration) form with the US Census Bureau in order to export our things from the US. I asked Crystal to check out the Automated Export System web site (which is entertainingly entitled, "AESDirect - Reduce Exporting Stress with AES"). After a few minutes of clicking around, Crystal said, "I'm not so sure about this." It seems that in order to fill out this form you have to register with the web site, at which time you are sent three emails describing the next steps. You then read the online user guide (73 pages) and take a "quiz" (don't worry -- one only need answer 27 of 30 questions correctly to pass!). Then three days later, you get enabled for filing your paperwork online. Since we really wanted to get our pile of boxes out of our house and on their way today, it seemed wise to take up our shipper's offer to file the paperwork for us for a mere $50. But we've now dropped off our boxes for the first leg of their journey to Durham. 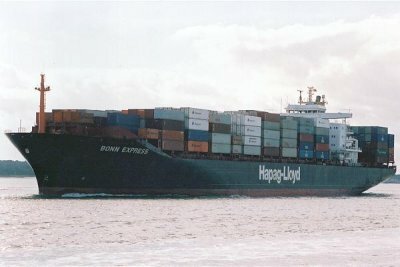 They will take a truck from Dallas to Houston, and then board the Bonn Express (see the complete schedule) for Charleston, Antwerp, and finally London. After a hopefully uneventful pass through customs, they should be on a truck and then to our home in Durham. Now as long as I don't dwell too much on the all-too contemporaneous terrorist threat against merchant shipping I'll be able to sleep well tonight! My aversion to going and getting my hair cut has been a constant throughout my life. Maybe it came from my dad and those crew cuts he gave me as a child, or maybe from having someone with scissors asking all sorts of questions about what I want that I never had any idea how to answer. Fortunately when I was in California, I had a hair-cutting friend who was willing to cut my hair in exchange for my accompanying him when he sang at weddings and funerals. It worked out nicely -- he just cut my hair in a way that my mom approved of and never asked any difficult questions about what shape it should be in back! But when I moved to Vancouver I lost my personal haircuts, so I went on a haircut-strike for several months. After about six months, friends started offering to loan me scrunchies to control my new hippie look. And Crystal testifies that she was starting to fall in love with me despite my hair. Clearly something had to be done. Crystal, sympathizing with my desperate straights, took me to her stylist Sherry. This was likewise an adventure, not because of Sherry's scissors (she's very kind and capable), but because her husband would sit and talk to me about theology in a very intense way while I was getting fixed up. Well, enough of the history. With our move to England coming very soon, Crystal didn't want to repeat the Vancouver hippie experience. So with bravery and precision that would impress a surgeon, she took her first cut (literally!) at my hair. The feedback has been uniformly positive, but I'm not sure I'm willing to post the results on the web in full resolution quite yet.... But here's enough of a picture to prove that my head is still intact. Crystal has assured me that she'll keep practicing!